Some people dream of being on television. For me, I think it’s fun when you can say, “Did you see me on tv?” Plus, it’s neat to see celebrities in person. I have been lucky enough to see several different tv shows taped in New York. Just last week, I got Live with Kelly tickets and the week before I saw a Late Show taping. What tv shows would you like to see in person? 1iota tickets make it easy to see live show tapings in NYC for free. Let me explain how it works. Note: This post contains affiliate links. Please see disclosure for details. Watching the set while waiting for Live to start taping. What TV Shows are Available? What to wear to TV tapings in NYC? What is it like to see a Late Show Taping? 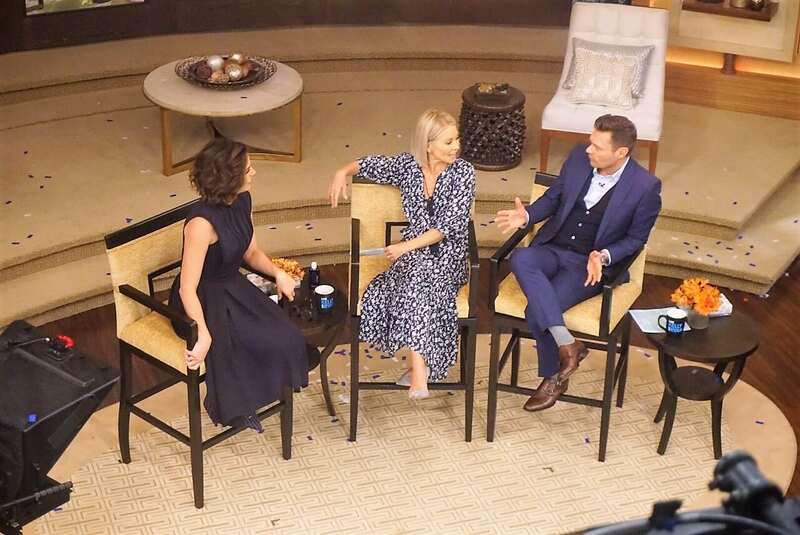 What is it like to see Live with Kelly and Ryan? 1iota is a website where you can request tickets to see tapings of tv shows in NYC (and other cities). You can also sometimes find tickets to special events with celebrities and movie screenings. It is totally free, you just sign up, complete your profile, and request tickets. It almost sounds like a scam but I have used it several times and can confirm it is the real deal. You are probably wondering – “What is the catch?” Well, yes there is a minor catch. You will have to wait. Shows do not want to be waiting for the audience so they ask you to arrive before the taping actually begins. The waiting time varies for each show. Even though you know that the time you have to get there is way before the time of the taping, you still need to get there on time. They always give out more tickets than needed so if you arrive late, you risk not getting in. The first step to getting 1iota tickets is setting up your profile. Once you have set up a 1i0ta profile you can request tickets. Requesting tickets is easy, use you 1iota login to access the calendar. You can search by the tv show you want to see. Alternatively, you can check the calendar of the day you want to attend the tv show filming. When you select the show you want to see, you can request the number of tickets you need. I think it most cases the maximum is 4. They will also ask you to comment and explain why you would like to see the show. I wouldn’t worry too much about what to put here. I just put that I was a fan of the show. Kelly and Ryan getting ready for the next shot on their show. 1Iota will review all the requests and let you know when yours has been approved. I didn’t have any issues clearing the 1iota waitlist, but I am sure it depends on the show and the guests. I would recommend requesting the NYC taping tickets as soon as possible. You can always cancel your TV show ticket request up to 24 hours before the taping. If you cancel less than 24 hours in advance or don’t show up, you may have issues getting 1iota tickets in the future. One of the things I like about 1i0ta tickets is that you know the taping date when you request the ticket so it makes it easier to plan. Other shows that have lotteries (like Saturday Night Live) may award tickets when you are not even in town. 1iota has a nice app as well where you can access your 1iota account and any tickets you have booked. If you are looking to get tickets to tapings in NYC, most of the options available are talk shows. Many of the late night shows are filmed in NYC. Currently, you can find tickets to the Late Show with Stephen Colbert, Late Night with Seth Meyers, the View, Live with Kelly and Ryan, Good Morning America, the Chew, and more. The availability and schedules of the shows vary, so check the calendar. Some of the more popular tv shows that tape in NYC will be booked for weeks in advance and other shows you may be able to request the day before. For example, Late Show with Stephen Colbert tickets need to be booked in advance. If you don’t find the show you want on 1iota you should go to the website for that show to find out more information about the taping. Choosing what to wear is important especially if you will be part of an on camera audience. If you are going to be on tv you need to look good! You should try to wear bright colors (within reason) because those look best on camera. Check the details of the show you are seeing to find any specific guidelines. First of all, thanks to my friend Edwin for getting 1iota tickets for The Late Show with Stephen Colbert. We arrived a few minutes after 3 pm and they quickly checked our tickets and then we stood in line. After a short wait, we went through security and then moved inside. We took a few selfies while we were waiting. They had a strict no photo policy inside the studio. After a short wait inside there was an announcement. I thought we were going to go into The Late Show studio but no it was time for a bathroom break. They said that if there was any chance you needed to go to the bathroom, you should go now as the bathrooms would be closed during and after the taping. Selfie with a cardboard cutout of Stephen Colbert. We still had to wait a bit longer after the bathroom breaks. They did have tv monitors playing the Late Show to entertain you, but with the crowd noise, I had trouble hearing it. Finally, we were allowed to enter the studio. They directed us to our seats and made sure to keep parties together. We got seats pretty close to the stage but all the way on the far right by the band. We could see well, but I knew there wasn’t much chance of us getting on camera. After a bit more waiting, a comedian, Paul Mercurio, came out to warm up the crowd. He was funny and even brought a few audience members on stage to take selfies. Then the producer spoke quickly and Stephen Colbert came out on the stage to answer a few questions from the audience. Then it was time for the show. Watching the taping of the show was interesting although I didn’t know a lot of the guests. I knew Michael Bloomberg, but the other guest were comedians I didn’t know (Nick Kroll, Tim Heidecker, and Eric Wareheim). I need to be better about keeping up with pop culture! The hashtag #puberme started during the show. Stephen asked other celebrities to share their awkward puberty photos on twitter using the hashtag and he would donate to help Puerto Rico recover from the hurricane. It has been nice seeing all the celebrities using the hashtag! The taping finished a little after 7 pm. I remember watching Live back when it was hosted by Kathie Lee and Regis, so I was excited to get Live with Kelly tickets. A lot has changed from the time when I watched the show, and recently Ryan Seacrest became the co-host. You may remember all the buzz when Michael Strahan left the show. Anisa with Kelly Ripa and Michael Strahan. These wax figures at Madame Tussaud’s are a little out of date! I was also surprised to see a lot about the show is still the same. Michael Gelman, the Executive Producer, and Art Moore, Executive in Charge of Production, were still there and they also still do the trivia game where both an audience member and viewer at home have the chance to win prizes. 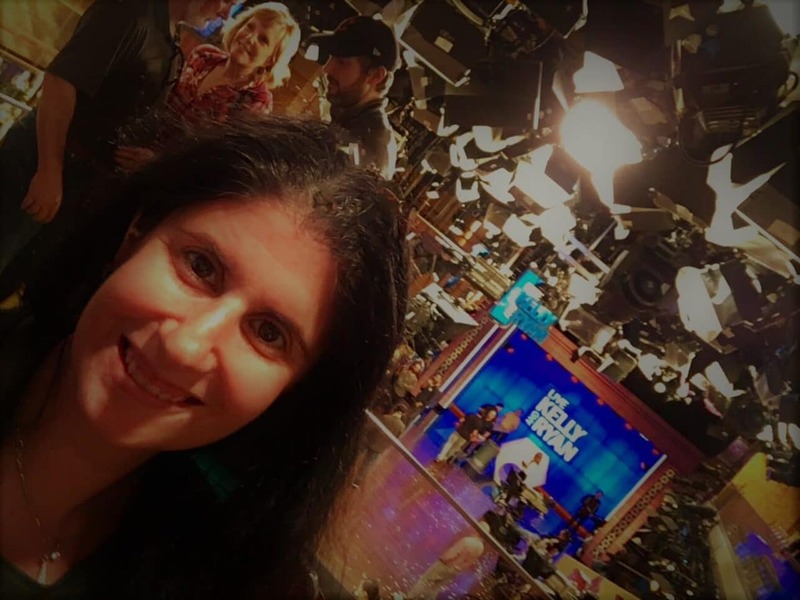 I had tickets for the Live with Kelly and Ryan Friday show that was being taped immediately following the Live Thursday show. We were asked to arrive at 9:30 am. We waited in line outside for a little bit while one staffer tried to sell us merchandise. Once we went through security we immediately went into the studio. We were actually able to choose our own seats. Instead of sitting way on the side like I had during the Late Show taping, I decided to try the balcony. I got a seat in the front row of the balcony right pretty much in the center. Obligatory selfie with the Live set. They came around and gave us numbers for the trivia contest. Ryan and Kelly would call a viewer at home. If the viewer got the trivia question correct, then they would get to select a number. If the viewer selected your number you would win a prize. They told us we could take pictures as long as you didn’t use flash. I was excited and thought it would be nice to use my good camera. I even took a photograph while they were filming. Unfortunately, I didn’t put my camera on silent mode so it beeped. I was a little embarrassed but no one seemed to notice. The host chat at the beginning of the show. You can see Gelman off in the right side of the picture. Michael Gelman came out to warm up the audience. He pulled four people out of the audience for a dance competition. The winner would get to be on the show with Kelly and Ryan. All the competitors had some pretty impressive dance moves, but no one could beat the pregnant woman that was dancing. After that, the filming started and Kelly and Ryan come out. I wasn’t chosen for the trivia prize, but it was a fun show. The guest was Lana Parilla from Once Upon a Time. I hadn’t heard of her either. Kelly and Ryan chat with Lana Parilla. 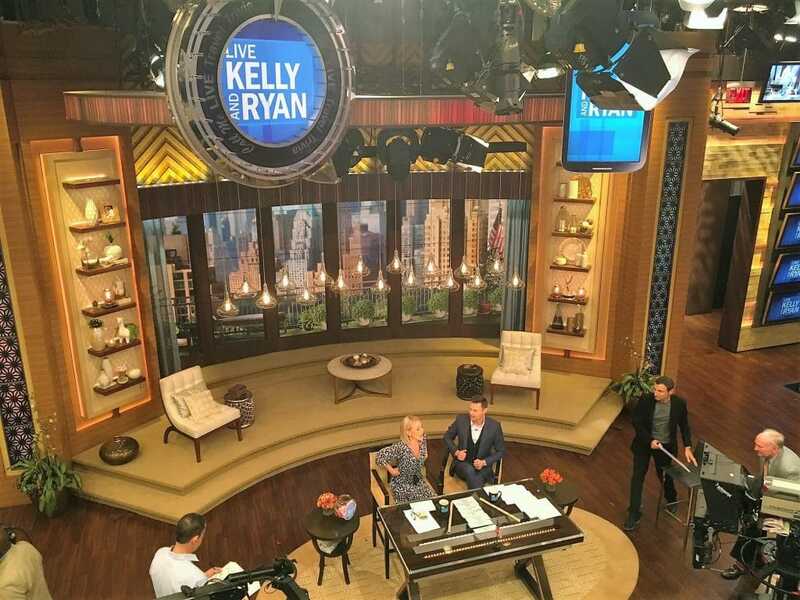 I enjoyed the taping of Live with Kelly and Ryan, and I was thrilled that I could take photographs. Also, I was impressed that both Kelly and Ryan interacted with the audience during the breaks and even took selfies. In hindsight, I wish I would have taken one of the seats at stage level. You could tell that the staff knew what they were doing and were very efficient. The taping was over by 11:30. TV show tapings are fun, even if you don’t know the guests! I would definitely recommend trying to see some while you are in NYC if you can. You just need to mentally prepare yourself for the wait and plan a little bit ahead. Have you seen any live tapings in NYC? I would love to hear about your experience in the comments. You can get free tickets to be in the live studio audience with 1iota. Plan ahead to make sure the taping does not sell out. Get to the studio on time to make sure you get in and get a good seat. If photography is allowed, make sure the camera is on silent mode. Follow the show’s rules to make sure you don’t get kicked out! This is amazing travel hacking for travelers and tourists who are fans of these particular shows. They can plan in advance and set a day/time aside for this. Such an amazing experience – wish I knew this when I visited NYC! How fun! I wanted to do a taping of Last week Tonight when we were in NYC but it was their off week! At least noI I know what it is like to go to one! Lesley – That is so unlucky! I hope you can come back and see a show at some point. Looks like you had a great time. This reminds me of when I went on my first school trip to NYC, I think we were invited to watch the Good Morning Show and then when my brother went he got to be in the audience for the Maury Povich show. It felt pretty cool, specially for someone in junior high but would definitely do it again as an adult! Jessica – wow I bet seeing Maury Povich and a morning show as a kid was quite the experience. Hope you get to see more shows as an adult. Very informative article. I went to a few tapings in LA through a similar site. This was so helpful and I will need to keep it in mind when going to NYC. It’s such a great opportunity to be on a live show and see some celebrities. My kids are big Once Upon a Time fans so they would have loved seeing the “Evil Queen” 🙂 Will definitely sign up for 1iota and may find one in LA 2 hours away. Mary – Excellent. 1iota does also having listing for shows in LA. I hope you can find some that work for you. Wow, this looks so much fun! It’s really useful to read about this sort of thing as I didn’t know it was easy to become part of the audience on famous shows. Great read. Mattea – Thanks. It is a lot of fun, so I hope you get the chance to do it. What a cool experience. I’ve seen a few recordings here in the UK and there really is a lot of waiting but you’re right, it is very cool! I am coming to NYC in a couple of weeks so i think I’ll check 1iota out. Thanks! Rosie – Glad you found the post helpful. What shows did you manage to see in the UK? Was there a similar website that you used? OMG this is something I have to do next time I’m in NYC! I have always wanted to see one of these shows but thought for sure you had to pay a lot for tickets in advance. Good to know it’s free and relatively easy! Kristin – That’s great. I hope you get to see a show soon. Ketki – Thank you. I hope you get to see a show one day. Chiera – I hope you get the chance to see lots of shows next time your in NYC! WHAT WHAT!!! That’s such a great tip! I need to hop on a plane to NYC and see a Late Night Show taping. Wish I would’ve known that when I visited last time! Lisa – Thanks, happy to share. I hope you make it back to nyc so that you can see some shows! This looks like so much fun! I I was just telling me friends that I want to plan a LA girls trip and go to some show tapings! Leigh – It really was a lot of fun. If you go to LA 1iota has shows there too. Nancy – It really is a lot of fun. I hope you get to see one. Ooh fun! Would love to catch a late night show! I managed to score 2 seats for MTV’s TRL back in 03 and Mario was hosting instead of Carson Daly! My friend even made a shout out! Was fun but not my scene! #TheWeeklyPostcard! OMG!!!! My dream is to do this! Now that I’ve been all over the city I can now waste time lining up hahaZ so on the list for next time! I am so remembering this! Thanks for the tips! I love Kelly and Ryan! Toni – Yes you would love this! If you are a fan definitely do Kelly and Ryan. That was probably my favorite show to see. That’s a cool idea and different to the usual stuff you do when visiting a city. Even if you do not know anyone of the guests, I think it’s still interesting to see. I never thought about it, but will do so when I’m visiting NYC the next time. Thanks for the inspiration. Nicola – I agree. It didn’t really matter to me who the guests were. I hope you get the chance to see some shows next time your in NYC. What a cool thing to do. I think being able to watch the whole process of a show being put together would be fascinating – I think that’s my high school drama coming out in me. Sally – Yes I loved seeing the behind the scene stuff! This seems so fun! I would love to do this. I really thought you were sitting with Kelly in that picture! LOL! Michelle – Haha! Yeah they do a really great job on some of the wax figures at Madame Tussaud’s! Haha! Sometimes they do tell you the guests in advance but a lot of times you don’t know. You would need a bit of luck to see your favorites. Thanks so much for these tips, I’d never heard of 1iota before and I’d love to get tickets to see the late night talk shows! I watched a Big Bang Theory taping a few years back in LA, which was one of the highlights of that trip. But recently I’ve gotten more into the late night talk shows, as the comedians’ take on current events is one of the few ways I can keep up with what’s going on without losing my sanity. I love The Late Show with Stephen Colbert – lucky you!! Pinned for future reference! Michelle – 1iota does also have sitcom shows but not many are filmed in New York. Stephen Colbert does do a great job of helping us laugh at the current situation. I hope you get to see a taping. Great tips for those interested in attending these tapings, Anisa. I don’t think I would enjoy spending time at any of them though. I never have time to watch any of these shows anyway. Anda – Thank you. Yeah I rarely watch any tv these days, but I did enjoy the tapings. This is great to know! Next time I’m in New York or L.A. I am definitely signing up for 1iota. Thank you!! Sherrie – That is great, I am sure you will enjoy it!